Fight or flight – it’s what humans do. This week, both Axe and Chuck made the decision to fight, and if they were going to die, they were going to die with their boots on! I liked that Taylor wants to go into business with their Dad. But this being Billions, I have a feeling things are not going to go so smoothly on the Good Ship Mason! And Taylor taking advantage of Axe being hacked? It may seem shady, but it was the opportunistic thing to do. Axe said he would have done the same (9/11 anyone?) as would have I.
Rebecca is a great fit with Axe. She is as tough as they come, and smart as a whip. Can you think of anyone Axe would have sent to the board meeting he trusts more than her? And, she came through big time, with leverage to get rid of that CEO that perhaps Axe wouldn’t have had. I know many of you miss married Axe and Lara, but Rebecca is more his equal, and I just love the dynamics of their relationship. Damianista and I debated this on Friday evening and I loved our back and forth! I totally get that Chuck did not want to have the Sword of Damocles over his head. If you back down once to a bully, you will always have to. I don’t have any issue with Chuck admitting to his personal sexual preferences, which was in the committed, consensual confines of his marriage. And I applaud his speech at Fraunces Tavern: it is easier to live your true self than to live a lie. So, I don’t think this is about Chuck vs. Foley. What I have an issue with is what he did to Wendy! They agreed he would drop out, and not expose their private life. He lied to her face! She was completely blindsided, all for his own ambition and advancement. The feeling of being betrayed by the person you trust the most is gut-wrenching. Maggie Siff gave a stellar performance, and conveyed the hurt, shock, and humiliation Wendy was feeling, without uttering a word. Chuck won his election, but the first thing I noticed was that Wendy was nowhere to be seen. Was it worth it? Chuck may have gotten everything he wanted, but if you don’t have someone to share it with, what’s it all for? Is the possibility of losing the best thing in his life the price he is willing to pay? I’d rather struggle with the one I love, than have everything and be alone. We don’t know if this does irreparable damage to the Rhoades marriage, so I know I’m speculating. The humiliation from others may pass, but the trust that has been broken may not. I had started to like Chuck a bit this season, but now he is lower than dirt. I also found it very interesting that Wendy actually took the Skype call from Taylor; she could have ignored the call, but she didn’t. I believe that the was concern was sincere on Taylor’s part. Could this break the ice between Taylor and Wendy? We have seen previews of them meeting and talking. Billions started as a show about two Alpha Males battling it out. How great would it be if at the end of the day it’s Wendy and Taylor who are standing victorious over the rubble of Chuck and Axe! Both Taylor and Wendy were loyal to their respective partners, even when they knew these boys were not on the up and up. The straw for Taylor was Axe’s betrayal using Oscar, and Wendy’s was Chuck not respecting her wishes. When these men used them as fuel to advance themselves (as opposed to using others), that was the red line that was crossed. A combination of Wendy and Taylor would be, I believe, too much for those boys to handle. I’m calling it now: I’ll be on #TeamTendy! And now, the Attack at Axe Capital! Axe can’t let the Street know what he is doing. As soon as it is known Axe Capital (AC) is getting out of all LNG positions, the Street will know something is up and possibly start dumping their positions in LNG as well, sending prices of those stocks plummeting. Trading through dark pools (a type of alternative trading system that give investors the opportunity to place orders and make trades without publicly revealing their intentions) will help keep the secret for now. As the opening bell rings, Ben Kim prepares to place orders through his Bloomberg terminal when all screens go dark! Panic sets in as no one quite knows what is going on. IT Greg informs the group it is the AC Network that has been disabled! As Greg tries to reboot the network, the truth becomes clear: AC has been hacked, and it has a Russian scent to it! This must be Grigor’s payback to Axe for front running TMC. Grigor did tell Axe to leave Taylor alone, and he was not joking. Greg will try to get the backup working, but as precious moments tick by, so does millions of dollars! While I was watching this scene (and you can ask Damianista, she was right next to me!) I was literally on the edge of my seat. I’ve been in similar situations where I had live, open positions and my power went down, or my trading platform server crashed. You are blind and have no control of your positions. A minute in the market is an eternity to a trader and can cost you millions. You feel like you can’t breathe (at least I did). These are the scenes that make me love this show – the 100% relatable situations that only a fellow trader can truly appreciate. And, the hits just keep coming! Not only is the network compromised, the phones and the links to the trading desks are down as well. AC has become a bunker, cut off from the outside world. So, if the palace is under attack, act like you’re not in the palace. Axe instructs everyone to get on their mobile devices and use the EMSX app. Most trading platforms have a mobile app so you can trade when you’re out of the office. AC uses Bloomberg as their trading platform, so EMSX is their mobile app. Ben Kim has a non-networked laptop, so this may be the lifeline AC needs. First trades: 50,000 shares of Con-Pipe (CNPP), and 100,000 shares of Southern Gulf Petro (SGP) at the market. Placing a trade ‘at the market” means your order will get filled immediately, at whatever the current trading price is. You can also place a limit order or an order at a specific price. Ex: Sell 50K shares of CNPP at $290. The order will only be filled at that price. It will sit in a queue until the stock hits that price and your order is filled. Depending on where the stock is trading, you may get filled right away, or not at all. Since AC is in crisis mode, trading at the market is a necessity. They may lose a bit on the stock price, but need to get the names off their books immediately. Axe needs these trades done through dark pools so no one can see AC is dumping these positions. Dark pools are mostly anonymous, but most really experienced trading desks have ideas of who is trading what. AC’s trades may not be anonymous for long. The first trades are confirmed, and it looks like CNPP made $14M and SGP about $981,000. Not a bad start! However, it’s not going to continue to be this easy: Ben Kim’s laptop crashes, and everyone else’s devices are locking up as well. Anything that has been connected to the network recently is infected. Axe knows this level of infiltration can only be Grigor. Axe will deal with him later; now he does what a true leader should do: put out the fire and protect his “book”. Exactly how do you do that in a world where technology rules supreme? Well, ya gotta go old school!! Axe, Wags and Bill all came up and cut their teeth in the time before everything was so computerized. Imagine way back (you know, like the 80’s!) when in order to place a trade you picked up a phone, called a broker (or a trading desk) to place an order. The order was then conveyed to a “runner” on the trading floor, who would get the order to a floor trader. The floor trader would then make the trade with either another floor trader from another firm, or the “specialist” at the stock’s post on the floor. Once the trade was executed, the runner would then confirm it to the broker, who would confirm it to the client. That is why when you look at videos from the NYSE trading floor back in the day, it looked so chaotic. The floor was where the business all took place. I was never on the floor of the NYSE, but spent many a busy day on the floor of the American Stock Exchange in the Option pits. If you watch CNBC now, the NYSE floor looks dead, all due to everything going through computers. I work from Long Island, and my partner works from San Diego. We can be anywhere in the world to trade. That is the beauty of the technology; the ugly side is what we are seeing going on at AC. Axe and Wags are going to fire up the DeLorean and go “back in time” to right this ship! The youngsters at AC look like deer in the headlights! Nobody knows anyone’s phone numbers or even how to do a voice trade! Everything is done by “chat” through the terminals. Well children, take a seat and watch the masters at work! Axe for some reason has a bag of burner phones and wants calls made to the CEO’s of all the prime brokers AC uses to get direct lines to the trading desk, and to anyone else who can “make a market” in the names they need to sell. This is a great strategy by Axe. He and Wags know that their relationships and reputations with various brokers and traders will be able to help get these trades done. However, as an outsider, the minute I hear Axe or Wags is personally making calls to get trades done, I’d know there was blood in the water. I would play the hardest of hardball because I would know AC is up against it. That is just how this business works. Bill once again proves his value: his black book is written in “non-hackable” ink, and it’s a treasure trove of info, particularly a contact at the Toronto Stock Exchange that can move some shares “nice and quiet”. Axe and Wags work their magic with the personal touch. They are laying it on thick to get what they need, making promises galore (there are going to be some disappointed people at the US Open this year!) They are putting on a clinic for the children! AC watches the gas terminal explode, and they know they got out in front of the story (and the market) as best they could. The rest of the Street (ex TMC of course) will be dumping shares as prices in that sector nose-dive. The saying we have for that is: trying to catch a falling knife”. At the closing bell, AC has gotten out of 90% of their LNG holdings – all due to the smarts, knowledge, and experience of Axe and Wags. I seriously doubt anyone could have done it better than this Dynamic Duo. And let’s not forget Bill, who saved the firm $70M with his connection from the North! 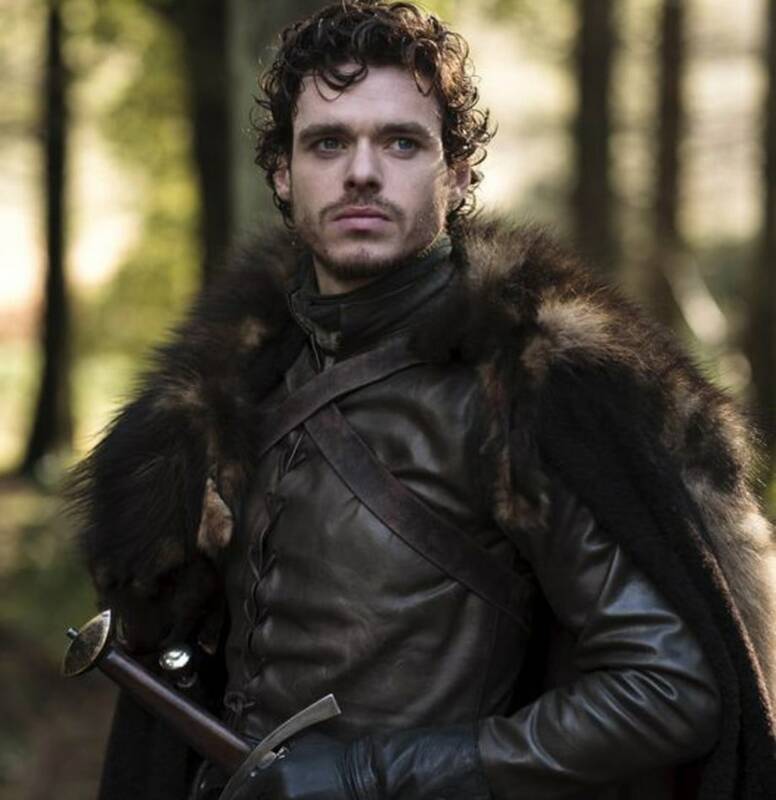 (Robb Stark?) I think this may start to make up for his chicken fiasco! The display that Axe and Wags put on in front of the troops makes you understand why the Axe Cappers are willing to follow them almost blindly: these are men, when their backs are to the wall, will get it done! Axe knows he was almost bested by Grigor and that this could just be the first of many attacks. He needs to eliminate this threat once and for all. How can he do that? It’s easy when you have the New York State Attorney General in your pocket. Chuck rewards Axe’s support by getting Grigor out of the country and out of Axe’s hair. Chuck has frozen Grigor’s funds and will have him declared an “unregistered foreign agent” with intent against the U.S. unless he leaves the country. Grigor tries to tempt Chuck with “establishments you would not believe”. For a minute, I really did think Chuck might take the bait, but no. Chuck gives the Russian 12 hours to get out of Dodge. Axe doesn’t want Grigor to leave without saying bon voyage, so he makes a special trip to the airport and Grigor’s private jet. Axe will not be scared off by anyone, but just to show there are no hard feelings, Axe will get Grigor’s TMC funds unfrozen, and delivered to him once he lands in the Motherland. There is one condition: it all ends – no sending someone after Axe because “there is nothing I won’t do to defend what’s mine!” Grigor agrees (a bit too easily if you ask me), but if Axe steps one foot into Russia, all bets are off. Somehow I get the feeling this isn’t the last we have seen or heard from Mr. Andolov. Taylor no longer has a protector. Chuck may no longer have Wendy. Axe has an AG at his disposal. Wendy and Taylor may become friendly again. Alliances are shifting like sand, and we are only 1/3 thru the season! how come N Gas would not go up after a disaster not down. Would you not want to be in those positions instead of liquidating them like Axe did?? Did not make sense to me. When news comes out like that (and explosion or other disaster), the initial reaction will be that stocks related to that industry will be down – bad news always sends stocks down at first. There could be lawsuits, federal investigations, etc. However, you could buy futures on nat gas, and since supply would now be limited, the commodity would be more valuable. The pipelines or shippers would take a hit because since they would have less product to ship, they would have less revenue. Also remember, even though this a show about a hedge fund, it is entertainment as well, and I think in this instance they were focusing more on the hack than the actual trades. Wonder if I could get some clarity regarding the difference between on phone call trades versus electronic ones, specifically regarding the brokers and their fees. Are trades made by computer just automatically done once you input the exact instructions/commands or are their brokers on the other side as well negotiating with you as they tried to do with Axe and Wags on the phones? Have you cut out such middle men entirely? Cause I don’t quite understand how the former could be streamlined quite as such from where it used to be in the latter back in the day when the Stock Exchange was a chaotic free for all. Yes, now that trades are placed through computers, they are executed directly to the floor, or on other electronic exchanges and/or market makers. Those “middle men” (and women) are all gone now. It one of the reasons where is hardly any exchange trading floors. Where I worked (The American Stock Exchange) was bought by the NYSE, and that floor went away, along with most of the people who worked there. The NASDAQ doesn’t even have a trading floor, it’s all electronic. There has been talk about even getting rid of the NYSE trading floor, but because it is such an “institution” that won’t happen – yet. There really is no need for a physical trading floor anymore.